The runners in front of me were negotiating a stream crossing as I picked out my footing in the ankle deep mud so I didn't pay much attention. At water's edge I tried skirting around the left side but the water quickly rose up to my knees as my feet sank in the mire. Pulling my left leg out I was gratified to see my shoe came with it. Back on to firmer ground I walked a dozen paces to let the majority of the muck drain out and started a slow trot up the next hill. The runners ahead of me slowly but steadily pulled away. Six kilometers down, just 44 left to go. It wasn't easy, it wasn't pretty, and it certainly wasn't fast but I completed the goal I set for myself; run a 50K race before my 50th birthday. 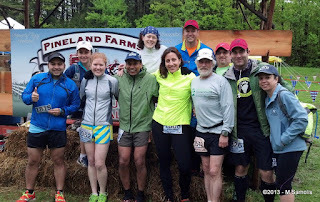 Several friends recommended Pinelands as a well run race with a nice course and good footing to try for my first ultra so I signed up in December and started training in earnest. The winter is a tough time to train, especially for trail running and I developed a pain in my left heel that left me unable to run at times. Plus, winter is ski season and Monica and I went to Austria for a week in the middle of February, so my training really didn't pick up until March. There were a lot of long runs, including a 22 miler and a few 19 milers that left me feeling adequately prepared, if not really on top of my game. A week before the race the forecast looked great, then things started going downhill. It was going to be pouring rain all week, including Saturday when the 5K races were all being run. The organizers posted that the course might be a big muddy. Monica and I headed up to a hotel in Freeport on Saturday night after Peter and Anne's wedding and it rained the whole way. We had every conceivable piece of clothing available for possible conditions during the race; me for running and Monica for crewing. Off to Dunkin Donuts for a breakfast sandwich and then to Pinelands to meet up with friends and get things started. When we arrived it was raining lightly but it seemed much nicer than it could have been. The 50 Mile runners were already on the course and you could see things were going to be slick. As we walked over to the sign to take a group shot several of us were picking our way to avoid the deep water. Foolish humans. In the first 100 yards of the race all of our feet were soaked and caked with mud, and it never let up for the entire course. I started running a bit faster than I should have, trying to keep pace with the folks I'd started with. My left heel was a bit touchy already, I wasn't sure how it was going to handle the day. By the time we reached the second aid station (the Yurt) we were all covered in mud and willing to stop, eat, and drink. It had sunk in that I wasn't going for any particular time, just trying to survive. Monica was at the Yurt aid station and I'd see her there twice more on the first lap. The sections though the fields were pretty horrific. The grass had been mowed to a 8 foot wide path, but the footing was an unrelenting mess. There were trampled paths on the sides or down the center, but it was only firm ground in comparison to the slop everywhere else. Mud squished out on every step, sometimes sending you sliding down an incline or stumbling while the suction tried to remove a shoe. Parts were nearly impossible to run and when we hit the drier sections I was too tired to run up most hills. It drained me physically and emotionally. There were two loops coming back to the yurt and I ate and drank each time. By the second loop I'd lost all the people I'd started with and settled into a slow but mostly steady pace. It was clearly going to be a long day. My left heel was throbbing slightly, letting me know it hadn't forgotten about me. At the Valley aid station Monica gave me my MP3 player and the music really helped. I had to fast forward through two songs as the day went on; Stairway to Heaven and The Long and Winding Road. As the loop took us past the start/finish area I saw the hoard of 25K runners starting their run. My main goal at this point was to avoid being passed by any of them. Looking at the finish times I think I mostly accomplished that goal. The last third of the loop was much drier but had more hills. I remember a very depressing sign that had an arrow pointing one way for "Last Chance Cut Off" and one pointing the way we were going labeled "Gloucester Hill". I spent this time mostly alone, running where I could and walking lots on the steeps. This was definitely the low point of my spirits and thoughts of dropping at the end of the lap came unbidden to my head. Monica was there at the start/finish which brightened my spirits, and just the act of completing the lap made me keep going. Everything was going to be familiar terrain after this - I knew what to expect at least. Finally, every step was bringing me closer to the finish which is an amazing psychological boost. At the starting line I was wearing shorts, calf sleeves, Dirty Girl gaiters, a long sleeve shirt under a short sleeve, a running jacket, gloves and baseball cap . Before the gun I handed the jacket to Monica as it was clearly too hot for it. At one of the aid stations I peeled off the long sleeve shirt and gloves since they weren't needed. Later I took my running vest from Monica and used that for the rest of the race. By the end of the race everything but the hat was covered with mud; I'm not sure the shoes will ever be the same. The socks went right into the trash. Most of the second lap is a blur - lots of slogging in the mud, holding out until the end of a song before taking a walking break, being passed by 50 milers, and lots of encouraging words from runners, spectators, and volunteers. As I approached the start/finish line, which meant I had less than 10K left, it dawned on me that I was really going to finish. I wasn't wearing my GPS watch and couldn't do math in my head but I think my pace finally picked up near the end. I could do enough math to figure when I'd passed the 26.2 mile marker and that felt real good. I ran without seeing other runners for long stretches as the kilometers clicked down. As I pulled into the Last Mile aid station I saw a woman who had passed me about 5 miles earlier and I used her as motivation to run the final stretch. I actually passed her about 100 yards from the finish line, expecting to run in with her but she held back so I finished solo. I made it look good for the remaining spectators - Monica was cheering me home and that was the best part. This was an amazing experience, both the race itself and the training. I've gotten encouragement and well wishes from lots of athletes, many of whom were there that day running along with me. It's a goal I set for myself two years ago after finishing the Boston Marathon and there were times of injury and pain when I thought it was never going to happen. My biggest support is Monica, who gave up lots of weekends up north because I had to train, or was recovering from training, or was blathering on about training and my injuries. Seeing her 10 times on the course meant the world to me. I have no idea if I'm going to run another ultra. Certainly not for a while as too many things have been on hold while I pursued this goal. We have other plans for the summer and while I'm sure I'll be running quite often I am enjoying the freedom that comes with no deadlines.